Arjuna bark has been used for centuries in traditional Ayurvedic medicine to support cardiovascular health and overall health and wellness. 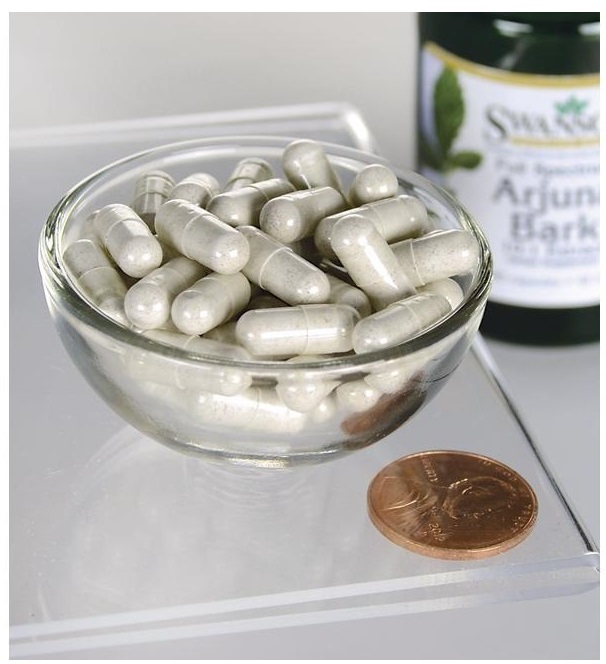 According to animal research, Terminalia arjuna herb demonstrates antioxidant activities comparable to vitamin E. It is the leading cardiovascular health supplement in all of Ayurveda, and now Swanson Premium Full Spectrum Arjuna Bark (10:1 extract) offers the same great support in an easy to take 40 mg capsules. Ancient medical scientists have mentioned the properties of arjuna herb in their writings. Indian medical knowledge known as Ayurveda goes back millennia. The Vedas and Puranas refer various materials of medical importance including herbs, plants and trees. Modern research has discovered that arjuna has antioxidant properties and may be clinically helpful in cardiovascular health (heart disease). Cardiac health: Arjuna is a well-known heart tonic and cardio-protective herb. It strengthens the heart muscles and treats the cardiac debility. It also increases the coronary artery flow and protects the heart muscles from ischemic damage. It is suggested to use its decoction with milk or ghee or clarified butter. Arjuna is the best known ayurvedic herb for the heart. Piles: The medicinal wine of arjuna bark, dhataki and manuka-blackraisins is helpful in treating of bleeding piles and leucorrhoea. The patient should to take 2-4 teaspoons twice a day. Body odour: The powder made of equal proportion each of arjuna flowers, Jambu leaves and Lodhra bark when applied over the body, helps to remove body odour. Fractures: When the paste of the bark is applied over the fractures, helps to promote early healing. Pimples: Apply the paste of arjuna or in combination with other herbs along with milk helps to reduces pimples (acne). spots and makes the face blooming like lotus. Teeth cleansing: Arjuna twig is used for teeth-cleansing. High Blood Pressure: The medicinal herb has diuretic properties, reduces the chances of clot formation, lowers blood lipid thereby helpful in treating of high blood pressure. Chest Pain: The use of the bark of the herb is beneficial in curing of chest pain. Breast cancer: The herb contains a substance called casuarinin that seems to prevent breast cancer. Panacea for heart: The herb is used to treat all the problems, diseases and disorders related with heart. Antioxidant: It is used as antioxidant to combat free radicals thus prevents against many diseases and disorders. Cholesterol: The proper use of the herb helps to maintain healthy cholesterol level. Vitality: It is used for vitality. Lymph tonic: It is used as lymph tonic for the heart. Blood flow: It promotes normal blood flow. Heart stress: It helps to nullify the effect of stress on the heart. Blood thinner: This herb can be used as blood thinner. Giddiness: It reduces the symptoms of giddiness, headache and insomnia.